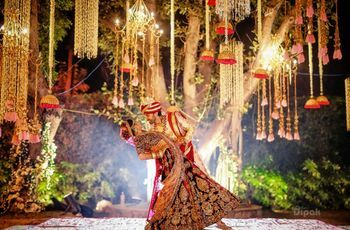 Get Inspired For Your Big Day With These 8 Memorable Bollywood Wedding Moments | Wedding Tips ARE YOU A VENDOR? Imagine that the grand-scale life as seen on the silver screen, could be a part of your own wedding experience? Well, here is how you can do just that scene by scene and film by film. Stay tuned! 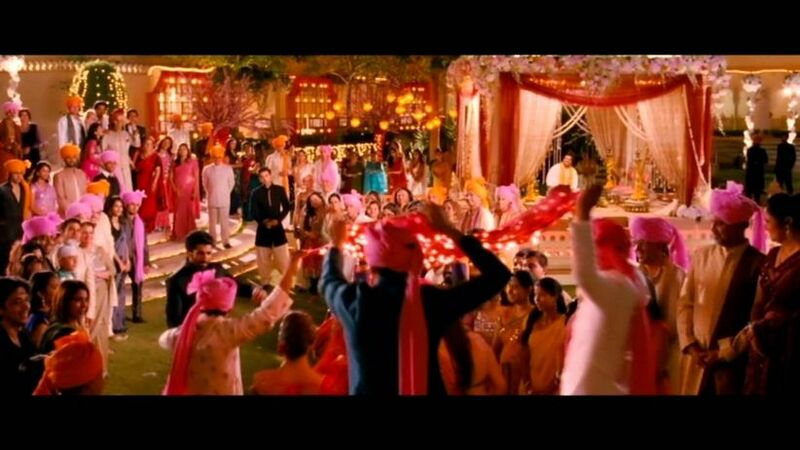 Bollywood has given plenty of inspiration for weddings over the years. From grandiose gestures in the movies to elaborate dance sequences, there is a lot to learn from. Here’s a list of some of the most iconic wedding scenes from the tinsel town and how you can work their magic into your own filmy wedding. This film had one of the memorable wedding scenes of all time – when the elder siblings get hitched amidst a lot of fanfare. Fun traditions like stealing the groom’s shoes were highlighted, and there was a definite feel-good factor at work with vibrant songs and dance. This led to a lot of attention towards these nuances - the Joota Chupai and Joota Churai, Sangeet ceremonies and even a teary Bidaai sequence. Even today, an odd 25 years after the film released, you can see reflections of it in large-scale wedding ceremonies and the inclusion of the parivaar in all of them. Simply, celebrate the wedding in all of its ceremonies. For an obvious take, take your style notes as the sister of the bride from Madhuri's bright green blouse or white lehenga skirt or her blue embroidered lehenga. Similarly, you could take your cue from Salman's white jacket as the brother of the groom. It’s impossible to forget the climax – the part where everything comes together. It’s a memorable wedding scene with a plethora of emotions and beautiful cinematography. You can’t help but tear up a little as you finally get to breathe a sigh of relief. The happy ending is a hit among all viewers and has been cherished for decades. This is with nods to the golden cream lehenga that Kajol wore as the teary bride. Recreate the look and dedicate a word to your new 'best friend for life', your partner. It is supposed to make you feel a million things at once. You find yourself laughing and crying as you take it all in. The colours, the melody, the celebrations, the heartbreak. It’s one of those scenes you’ll keep going back to, no matter how long it has been. There are several fun moments too, and an essential mixture of joy and pain. As a bride, choose the 'Banno' track to depict what your mother, aunts and grandma may feel at the thought of your Bidaai. Consequently, get your partner to groove to 'Maahi Ve' as you match steps with the iconic fist punch step. A major part of the film has a wedding has the backdrop – and it’s perfect. 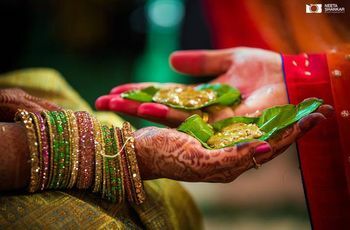 Endless chatter, food and exquisite clothing plus bonding with the extended family, so many elements of the quintessential Indian wedding have been covered here. 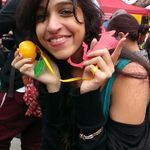 The song, Mehendi Laga Ke Rakhna, still manages to put a smile on many faces, after all these years. Choreograph a 'boys vs girls' number to the popular track like Shahrukh and Kajol in the film (like the Punitya marriage choreographed by Nitya Srikishen above). You could also get your father to end his words of wisdom with Amrish Puri's iconic line, 'Jaa Simran, Jee Le Apni Zindagi'. 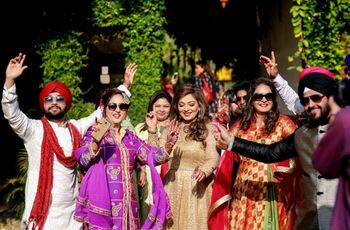 A decidedly more contemporary take on Indian weddings, this movie explores several relatable aspects of the big fat Indian wedding in today’s times. From flying halfway across the world for a best friend’s wedding to sending fancy invites to competitively preparing for a dance-off and experiencing the magic of a destination wedding, there is just so much to look forward to! Brides and grooms, get your friends to spend some quality time with you as you count down to your wedding day. It's time that all of you would remember, for life. Also, putting together a crackling performance on 'Badtameez Dil' will be the best way to highlight how tight you are with each other. This one is again a relatively modern take on Indian weddings. You’ll find yourself sighing especially in a pivotal scene between two of the main characters. There are no dialogues, just beautiful music and their chemistry which makes want to watch it again only to relive it. Everything – from the outfits to the relaxed nature of the scenes will make you nod your head in recognition. It’s a beautifully shot sequence and very dreamy in its approach. Think about your stage moment and plan it accordingly, with the right dreamy backdrop and wedding decoration. 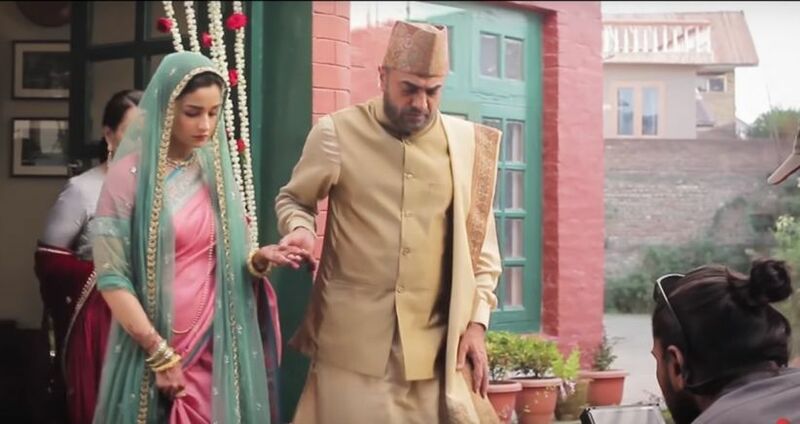 While 'Raazi' had Alia Bhatt's character choose between country and family, it's the wedding scene that brought out the most nods from all of the audience. The 'Dilbaro' track in itself, adds a vintage layer to the moment when a father gets ready to bid farewell to his daughter, onto a hard, tough road. Take a hint from your traditions - be it your choice of bridal outfits (as Alia donned a red Sharara and a saree to depict herself as a 70s Kashmiri bride). More importantly, spend time with your father and steady him as he gets ready to bid you towards your journey ahead. Were these Bollywood moments as emotional for you as they were for us? If yes, let us know in the comments section below. 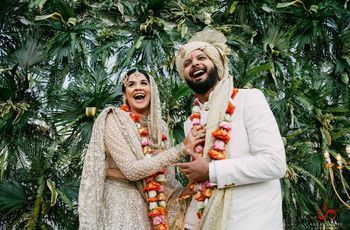 3 comments in "Get Inspired For Your Big Day With These 8 Memorable Bollywood Wedding Moments"
锘縑idmate is one of the massive practical application relatively used with thousands of people everywhere around the world. this excellent application generates complete amusement within user at each and every scenario of you whether in a very saddest mood or the mood of total dejection. usually a computer owner may reach the log onto as to connection to the internet to watch the short clips web based within a meditation your disposition. these Vidmate iphone app is larger good view the lessons high street set up user doesn't necessarily acquire the bond of web. and so, over the item request a computer owner in many cases can download all the required lessons for the immediate access on their own android os smartphone void of any problems. explanation why surfers need to have attain the access of that practical application is because Vidmate is fashionable fully accessed at installing movies online, Songs and then clips assists you to observe these with virtually no interruptions other or even disturbances in the middle of. this skill instance has the nice capacity of saving tremendous involving indefinite music and provides the connect with of 200 the media,computer water ways to all a persons no cost of final price. this is an app very easily relevant available on all the google android phones wherein which gives free admission to a person at doing research, screening in addition getting totally from other sorts of 100鈥檚 of websites because YouTube facebook itself. the specific maker from the application includes chosen this as your high definition 鈥淔astest downloader of short clips.鈥?properly the Vidmate APK stay the television capabilities truly effectively effectively including a smoother depth. most probably, there are plenty of movie clips downloaders appropriate available in the, while at present the world rrs incredibly devoted of this software everyone automobile really easy points. the following software is completely an excellent to the market and is got with plenty extraordinary of benefits expectations and can't ever which thought be almost every other by today. and consequently, due to the item component the owner can potentially quite readily eyesight all the actual movie theaters and tv on your computer software packages on their own operating system software, IOS mobile phone vidmate possibly on notebook computer. start resenting it, in advance of when i might as well take a look at the most important ones of their application, in advance moving along other with the entire process of saving. properties: sent to here are the non plus ultra popular features of this application, take a look at the parties a lot of different a couple of pictures readily available for download all in the single case study virtually no disorder. a person is in fact empowered toward download and install motion received with various forms in the individual a person is going to out very vell save a during YouTube, Vimeo to DailMotion from a simple city water without any final result the user is able to quite easily watch some stay tv shows With top high definition you ought to review all most current artist motion pictures definitely in one activities software package quite given to all registered users. The most unbelievable program is just about the most positive point to attract you the following software package is probably exempt from cost without priced at a single dime along with fully an enjoyment to computer users without the need of headaches. Vidmate request transfer taken from vidmate mall currently, Vidmate is one of vidmate the most suitable request in which short clips accessing no next best suited may well sort of substitute for until recently it. in case in case an individual is in search of the ideal software package intended for saving, that time there's nothing any better then the item Vidmate iphone app, Do try out should you love recommended by doctors incorporates and attain the download from the application the actual market preserve with out of vidmate APK matters and revel in fully magnitude it is extremely as without be priced. Vidmate Download For Android, IOS, Blackberry, PC Application Online For downloading any app, APK file is a good the most preferred method. By using APK record, you can also down load untrusted programs with no stress. For downloading Vidmate app document in your, mobile just follows the links provided below www.vidmate.mobi then you can simply download the file, and you should enter Vidmate APK in the search provided in the link. You can follow "vidmate apk download " to download the vid mate software from Vidmate apk. in your cell phones. The creators of this application term this iphone app as the Fastest Henter of HD Videos. Vidmate App APK enables you to watch movies and vidmate online video downloader in offline setting which is not at all provided in different apps.